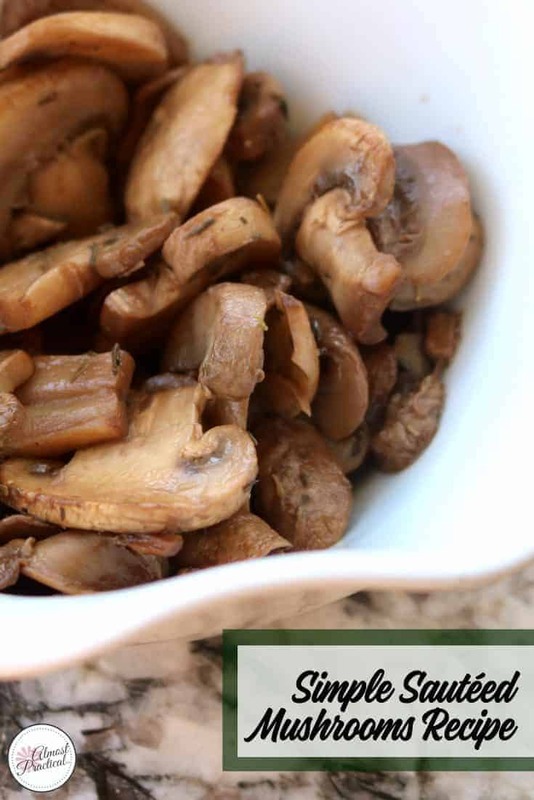 This simple sautéed mushrooms recipe is a staple in our house. I often serve mushrooms with chicken or pasta. They also are great in an omelet. However, it is not always convenient to cook up some mushrooms when you are short on time or when you've got a few other steps to your recipe happening at once. Luckily, cooking up a batch of mushrooms and storing them in the fridge for a few days is pretty easy. Whenever I buy a package of mushrooms, I will cook the whole thing using my simple sautéed mushrooms recipe and throw some into whatever I am cooking for dinner that week. I added thyme to this particular recipe but you can add any herb or skip it altogether for a more plain taste. Start with one 8 ounce package of white button mushrooms. Make sure you wash them thoroughly and get all that dirt off. Heat some olive oil in a pan. When the oil is hot – toss in the sliced mushrooms. Add in a half teaspoon salt, one teaspoon balsamic vinegar, and a quarter teaspoon thyme. As the mushrooms cook, they will release their water. I like to cook the mushrooms until the water is evaporated and you are left with dry-ish mushrooms without liquid. This usually takes about 10 minutes but it can vary. Use what you need and store the rest in the fridge for a couple of days. 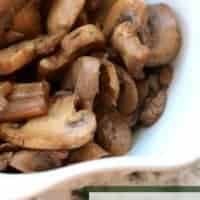 You can use this sautéed mushrooms recipe to add mushrooms to a homemade or a jarred pasta sauce. When you are making an omelet, warm these up with the vegetables. Add some mushrooms to wilted spinach or sautéed asparagus. Or just serve them plain alongside some pan cooked boneless chicken breasts. Toss them into this beef stew recipe just before serving. Heat olive oil in small sautée pan for about a minute. Add sliced mushrooms, salt, vinegar, and thyme. Cook over medium-high heat for about 10 minutes, stirring occasionally (especially in the beginning and towards the end, so mushrooms don't stick to pan). Mushrooms are ready when all water is released from mushrooms and more or less evaporated. « How Does Pinterest Work?